Errata: Yesterday, we posted that we used “coconut juice” in our Tom Kha Kai-inspired drink, the “Live and Let Thai“. In fact we used coconut milk, and the post has been updated to convey this. We apologize for the miscommunication. Gosh, we’re getting a little bored of Soju around here. Based on the traffic this week, I’m thinking maybe you were never that enamored of the idea in the first place. No matter! We’re almost through it, so thanks for sticking with us. James and I are done with Soju mixed drinks for a while. We miss the bite of harder spirits. This last one that we are going to share with you today was an attempt to simulate rum in a low proof environment. After ten days of infusing, our sugar cane soju had developed an interesting complexity, and even, dare I say it, a touch of hogo; that raw, grassy, sugar cane flavor. It was only a hint. We still had the Thai tea syrup sticking around from our Singha Highball drinks, and it turned out to match the flavor of the sugar cane soju very nicely. Moreover, the flavor of Thai tea, slightly spiced, with the roasted flavor of a black tea, did contribute a roundness to the drink that was evocative of the caramel and oak notes of an aged rum. We stuck to our trick of adding a teaspoon of bird’s eye chili-infused soju, and then added a dash of orange bitters for good measure. Regan’s has a clove and anise quality that complements rum very nicely, and similarly Thai tea, for it is spiced with star anise, and sometimes tamarind. Indeed, a bit of tamarind flavor would suit this drink, but it would ruin it’s clear, elegant texture. Stir over ice and strain into a cocktail glass. 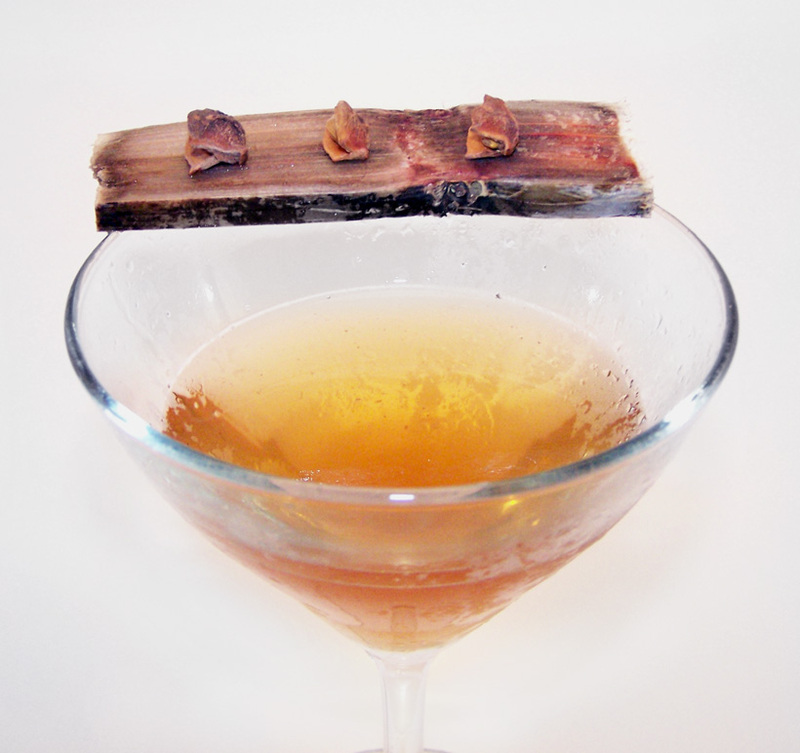 Carve a piece of sugar cane into a plank and rest three star anise pods on top. As soju drinks go, I enjoyed this one. Thai tea is completely delicious, and it’s really nice to drink it with alcohol, and without condensed milk. I can’t wait to mix this with regular rum! Incidentally, there were some Thai flavors that we did not get to explore for this round, particularly peanut and tamarind. I think this drink would be a pretty good candidate for a rim of crushed up peanut and sugar. But I’m done making soju drinks, so if you want to explore that avenue, please tell me how it goes. Tomorrow we’ll post a summary of our experiences with incorporating Thai flavors into low proof drinks, as well as our final recommendation for a cocktail menu built around some of these drinks. Talk about niche appeal. Fortunately, the world is vast and wide, and there are other cocktail geeks out there, who maybe, hopefully, found an academic sort of interest in all this. Special thanks to Kaiser Penguin for inspiring today’s photo. Categories: infusions, modern drinks, original creations | Tags: alcohol, anise, bartending, bird's eye chili, bitters, booze, chili, cocktail, cocktails, drinks, infusion, mixology, orange bitters, rum, soju, star anise, stir, sugar cane, thai, thai flavor, thai food, thai tea | Permalink.